What we learnt about Igniting Collaboration – The Teams Way from Microsoft Ignite the Tour 2019. Technologists, partners, customers and change-makers recently amassed in Sydney as Microsoft brought the Australian leg of Microsoft Ignite the Tour 2019 to Australia. Microsoft has taken the Ignite tour across 15 countries delivering industry leading content on emerging technology trends across collaboration, data, governance, adoption, security and more – so it’s not surprising we wanted front-row seats! More and more businesses are capitalising on the mobility and productivity benefits of making the move to Office 365 and Microsoft 365. As a Microsoft partner Maxsum is committed to helping our clients to navigate and capitalise on the ever-evolving Microsoft landscape with a view to maximising their return on IT investment. So hot off the press from Microsoft’s latest global event series, here’s what we think you need to know about the Microsoft tools and technology you use. Too many tools? Simplicity is key! The hyper-level mainstreaming of cloud computing has meant that today there are an absolute plethora of tools are available as-a-service, each claiming to offer bigger and better productivity wins that the one before! There are some awesome enterprise-grade tools around that are fundamentally changing the way IT is implemented, administered, monitored and used, and businesses of all sizes have access to low entry barrier tools previously only available to the big end of town. But at the end of the day, most IT conversations still come back to one central theme – making things simpler! Simpler decision making, simpler forecasting and budgeting, simpler management and much simpler ways to get the job done! What to find out more? Maxsum can help you evaluate and assess the rights tools and technologies for your business and how they might shape your future. Contact us for a one-on-one consultation here. Having access to lots of cool tools is great – but when it comes to technology tools and the time and investment needed to get IT right, less is definitely more! That’s why learning to leverage the built-in capabilities that come native to your Office 365 or Microsoft 365 subscription is a business win just waiting to happen! One of the most striking takeaways we had from Microsoft Ignite the Tour 2019 was the notable absence of the word “cloud” from the session titles and conversation in general. Does this mean that cloud is no longer top-of-mind? No, in fact it’s the exact opposite. In today’s mobile-first, flexible workspace-world, it’s pretty much assumed we’re all on some kind of cloud journey already. The question now has become – who’s doing it best and how are they doing it? The biggest thing we took away from Microsoft Ignite The Tour 2019 was that talk of collaboration is EVERYWHERE. We knew this already going in, but almost every session had some kind of collaboration focus – How to leverage Microsoft Teams to collaborate better; How to leverage the Skype for Business features in Teams for calling, chat and more; Top-line security best practices to ensure your team collaboration stays private and secure; Compliance and governance around who can and should be doing what, where and when…heck even the IoT and data conversations centred on capturing information for better sharing and…you guessed it – Collaboration in the modern workplace! Collaboration in the Modern Workplace – What does that mean? When you hear a term like “the modern workplace” bandied around, it’s pretty natural to just think “latest tech”. But the modern workplace idea is essentially built around people finding better ways to work and communicate as groups, rather than about the technology that they’re using. There are 2x as many teams collaborating across our workplaces. Teams is Microsoft’s answer to Slack. The powerhouse Teams collaboration app has been purpose-built to address the need for a platform that provides all Office 365 collaboration tools in one place, with functionality to bring in other third-party apps to the platform as well via tabs, connectors and bots. Teams is the fastest growing application in Microsoft’s history. It supports 44 languages and has 329K organisations actively using the application globally. Microsoft Teams is certainly attracting the lion’s share Microsoft’s current development focus, with a continuous stream of new features and integrations being introduced quarter on quarter. Plus, with Skype for Business Online features now transitioning into Microsoft Teams, more and more people will be trying out the chat and communications features within the Teams space. Microsoft’s vision for Teams is that it will become people’s number-one go-to app every morning as their central source of company news, content and communication. The rapid uptake of online collaboration tools industry wide has yielded a stock of early adopters who’ve charted the course already. 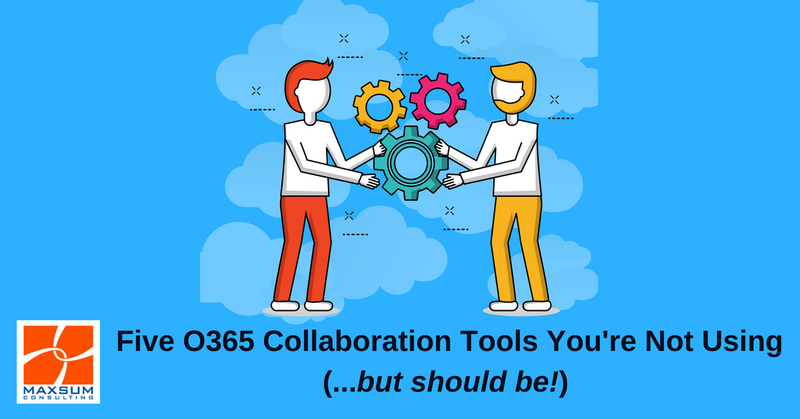 Their experience is telling us that there are definitely a few horses you need to put in front of your collaboration cart before you get going! Preparation, engagement and follow-up will be critical across the planning, implementation and scale-up phases of transitioning to Teams-based collaboration. Ask the governance, privacy and security questions right from the start. Communicate and engage with your staff for buy-in and adoption success. Make sure you allow collaboration and work processes to deliver real work/life balance gains. Give your team a go! Work together with an IT partner to plan and expand use. Assisting businesses to make the move to Teams and get more out of their Office 365 and Microsoft 365 investment is a key focus for the Maxsum team in 2019. Stay tuned for lots more Maxsum content and workshops to assist you on this journey. If you want to know more, Contact Us Here or give us a call on 1300 629 786 and let’s start planning!